Travel into the Sonoran desert for an exciting off-roading and shooting adventure combo. You're taken on some of the best trails in the Bradshaw Mountains, located just north of Phoenix. Travel through giant Saguaro cacti and deep canyons carved by flash floods, and cross the Aqua Fria River to experience this wild and vast desert terrain. Certified NRA instructors help you test your marksmanship skills with 9mm handguns, AK47 semi-automatic rifles and AR-15 semi-automatic rifles at a private shooting range in the desert. At your scheduled departure time, meet your guide in Black Canyon City and ride into the Bradshaw Mountains on an adventurous Kawasaki Teryx UTV. 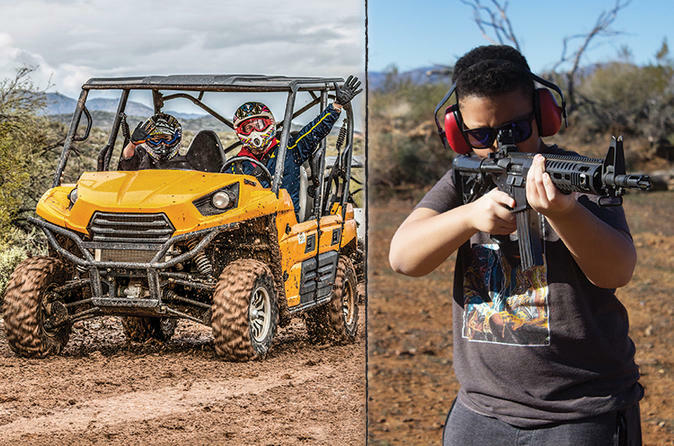 Rev your engine as you motor through the rugged landscapes of the Sonoran Desert toward a private shooting range that will both educate and entertain. Once you arrive at the desert shooting range, an NRA-certified instructor will inform you on the use of 9mm handguns, AR-15 and AK-47 semi-automatic rifles. Gun selections are updated on a regular basis to incorporate new and thrilling options. Ride back after your shooting adventure with new knowledge about gun safety and the Arizona desert. En route, take in the scenic beauty and possibly spot abundant desert wildlife such as coyotes, bobcats, deer, rabbits, and quail. This 4-hour activity includes 1 hour for check-in, 2 hours of UTV riding, and 1 hour shooting.